Capcom’s Kellen Haney took to the Unity Blog earlier today to give details on two of the characters appearing in Phoenix Wright: Ace Attorney – Spirit of Justice, the newest entry in the long-running visual novel series. The first of these will be a familiar face for longtime fans of the series. Spirit medium Maya Fey will be making her return in the sixth installment of the mainline series. Acting as Phoenix Wright’s assistant since the first game, fans haven’t seen her as a central character since 2007’s Trials and Tribulations (though she was seen most recently in the spin-off game Professor Layton vs. Phoenix Wright Ace Attorney). Maya has spent the years since then training to become the Master of the Kurain Channeling Technique, a title previously held by her mother. When Wright visits the Kingdom of Khura’in, he soon runs into his old friend, who has been working to further increase her mystical powers. Before long, though, it seems that Wright will have need of Maya’s unique talents once again. 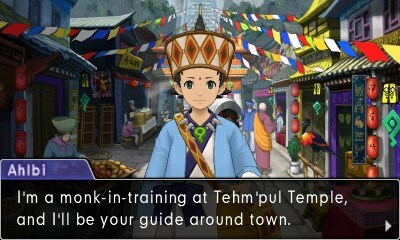 Making his debut in the new game (and keeping with the series’ pun-tastic naming conventions) is Ahlbi Ur’ghaid, a young boy who works as a tour guide in Khura’in. Ahlbi apparently takes his job very seriously and will go on hours-long tangents about the many complex facets of the kingdom’s culture if you let him. Not everything in Khura’in might be on the up-and-up, however, as Ahlbi is soon accused of both theft and murder. Wright quickly jumps to the boy’s defense, but it seems as though there is a deep hatred of lawyers in the kingdom, and Ahlbi wants no help from a dirty attorney like Phoenix Wright! Honestly, this kid seems like a prime client for the game’s first case. 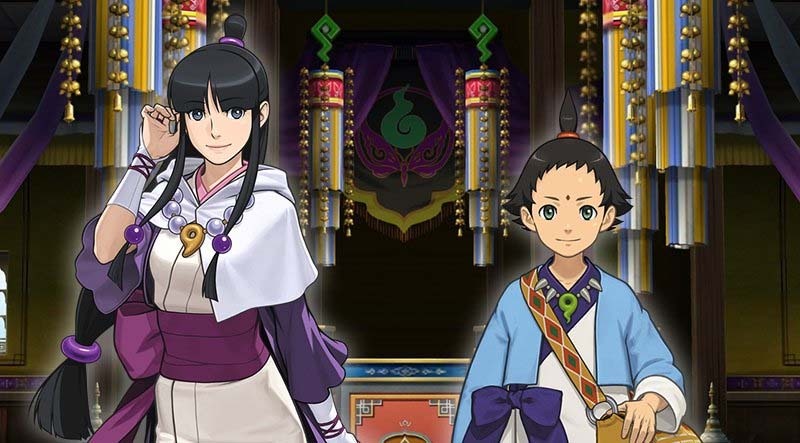 In the second of our series covering just some of the many characters in Phoenix Wright: Ace Attorney – Spirit of Justice, we take a break from our protagonist and newly introduced royal priestess Rayfa to focus on the return of Phoenix’s long-time friend, Spirit Medium (in training), and Ace Assistant, Maya Fey! We’ll also be discussing the capable (if not overzealous) new character Ahlbi Ur’gaid, a young monk who also works as a tour guide. Turns out these two have a bit more in common than one might think. Maya made her first appearance in Phoenix Wright: Ace Attorney as part of a twisting and gloomy case that implicated Maya as a murder suspect. Despite Maya being initially accused of the crime – an accusation that Phoenix quickly clears after taking on Maya’s case himself – Maya soon joins forces with Phoenix to find the true murderer and bring them to justice. Following the sad circumstances that resulted in Phoenix and Maya inheriting the Fey & Co. Law Offices, Maya soon decided that she wanted to take on the role of Phoenix’s assistant. This new friendship born out of tragedy resulted in not only the offices being rebranded as the Wright & Co. Law Offices, but also helped lift Maya’s mood, soon bringing her back to her naturally cheery self. Maya’s unique ability to channel the spirits of the dead (which causes her physical appearance to change as a result), alongside her natural intuition and optimistic outlook, helped Phoenix through many of his early cases – though her channeling sometimes caused her more problems than it solved! Eventually, Maya returned to her home in Kurain Village to continue her training as a Spirit Medium and perfect her usage of the Kurain Channeling Technique in order to become the eventual Master of the mystical art – though it seems that she kept in touch with Phoenix all the while. 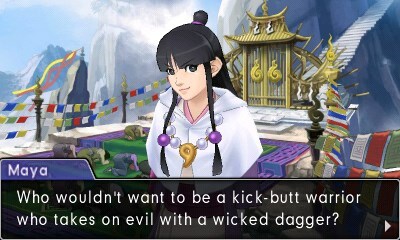 Leading up to the events of Spirit of Justice, Maya has spent the last two years in the Kingdom of Khura’in to increase her spiritual energy and complete her training so that she can be recognized as the head of Kurain Village – though it’s hard to tell if she’s been taking her training all that seriously. It is Maya, after all. Despite the many years between when we last saw her and now, she really seems like the same old Maya – just as spirited, just as big of a fan of the Steel Samurai and other heroes of justice, and just as ready to take jabs at Phoenix’s hair every chance she gets. Despite all her training, it seems like she hasn’t changed in the slightest – right down to her love of hamburgers and getting into all kinds of trouble where Phoenix may need to offer his legal aid. That’s at least one thing she has in common with Ahlbi Ur’gaid, a young monk who also works as a tour guide to show foreigners around the Kingdom of Khura’in. An industrious and energetic boy who loves to tell people about Khura’in with an eager “Allow me to explain,” Ahlbi puts everything he has into everything he does – particularly his highly detailed explanations of Khura’in’s history, which can take upwards of a few hours! More often than not, Phoenix has to put a stop to Ahlbi’s history lessons before they can get started, though it seems as though Ahlbi likes to talk about the places he showed “Miss Maya” during her time in the Kingdom of Khura’in, too. Aside from showing foreigners the sights and greeting people with the traditional Khura’inese greeting “hap’piraki,” Ahlbi also carries around the tools of his trade in the gigantic bag he has on his shoulder, including a sweet cake known as a magatah’man, or “soul bun.” Seems like he offers it to everyone he shows around the Kingdom. I wonder what else is in that bag of his, anyways? H-hey… was it just me, or did it move just now? It’s hard to believe that this earnest boy could harm anyone, which is why it’s such a shock when he’s accused of both the theft of his homeland’s holy relic and the murder of a guard at Tehm’pul Temple! Even so, when Phoenix jumps in to defend him, Ahlbi’s friendly attitude suddenly changes when he finds out Phoenix is a lawyer. It seems the people of Khura’in really do hate lawyers, but Ahlbi’s resistance to Phoenix’s help makes things that much more difficult. How do you defend someone who doesn’t seem to want you to defend them? That’s all for today, but next time we’ll be taking a trip back to the Wright Anything Agency to catch up with Apollo Justice, and learn more about the globetrotting international prosecutor, Nahyuta Sadhmadhi. See you then! Personally, I’m extremely pleased to see Maya finally making a comeback after so many years. I’m greatly looking forward to seeing how far she’s come along since we last saw her, as well as what stories we’ll see develop. The wait is starting to get unbearable, but Phoenix Wright: Ace Attorney – Spirit of Justice is set for release on 3DS on September 8.